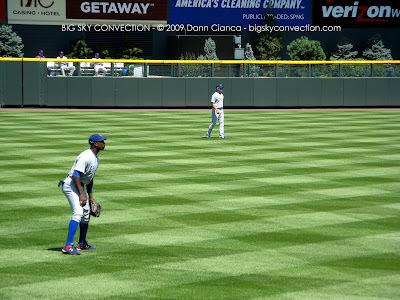 So, the weekend of August 7-10, I went to all four Chicago Cubs @ Colorado Rockies games here at Coors Field. 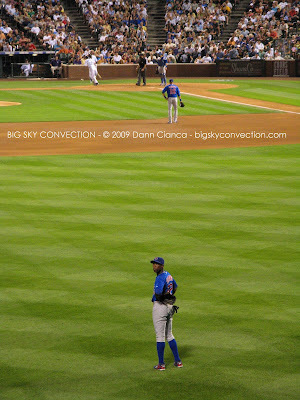 On the first night, I went with my family (father, mother, sister) and we sat low in the outfield (left). The Cubs lost that game. On the second, I sat in the upper deck on the third base side, but close to hope plate with my old roomies Katherine and Jami. The Cubs pulled that one out by a run ... and I got to see a couple homers. On the third game, I went with a couple friends and we sat very low near the left field foul pole. The Cubs got crushed. The fourth, I enjoyed with Tony Laubach and we sat in the mezzanine in right field. The Cubs were even worse in this one, letting Troy Tulowitzki hit for the cycle (though the triple SHOULD have been ruled an error) ... but bad play by the Cubs anyway. So, I've now seen 7 Rockies Vs. Cubs games and the Cubs have only won one. *sigh* "There's always next year". Yuup, I've all but thrown in the towel on this season. We need major bullpen help and need some starters to stay healthy. Milton Bradley = fail. They should've tried much harder to get Raul Ibanez instead who is having a career year with the Phils. 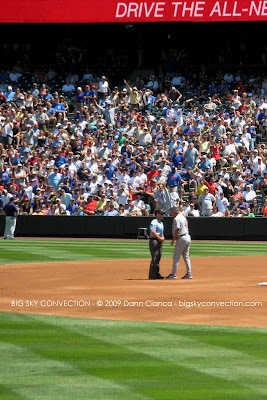 My overall record of Cubs games at Coors/Mile High is probably about 11-11. I'm 5-0 career at Wrigley though! Yeah ... this has been rough. Did you see Gregg the other night? At least Harden rocked it out yesterday. I saw Gregg blow 2 saves last year at Coors when he was still with the Marlins, then we pick him up in the off season and I was like WTF are they doing?! Very frustrating to see the team go backwards this year. Especially when the division is pretty weak.